In the recent quick and unexpected annexation of Crimea many observers noticed the sudden appearance of a strangely anonymous army that was securing “risky spots” on the peninsula. Its military men looked like elite assault troops, dressed in special uniforms, helmets, protective glasses, knee pads and always holding automatic rifles. Many people thought of them as Russian troops, but there was some doubt. On March 4, at a press conference in Novo-Ogarevo outside Moscow, Putin officially denied that any troops from Russia had entered the peninsula or that Russia plans to annex it. 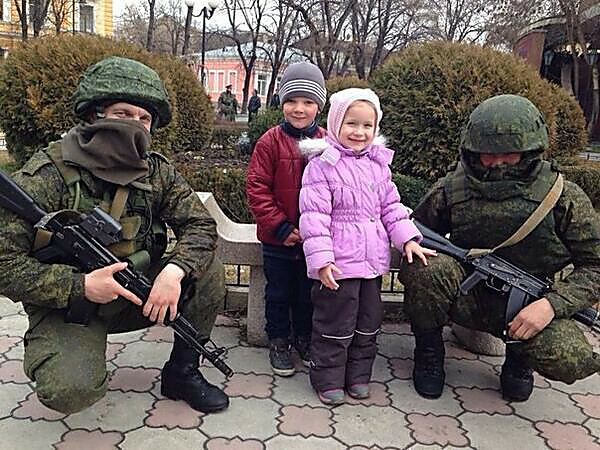 In fact, to most Russians, these troops did not look too familiar. Their uniform seemed different from the uniform of the Russian army. Besides, it had no insignia. Neither military nor political. The troops’ identity was hidden, as was the identity of individual soldiers – their faces were covered with black masks, leaving only the eyes uncovered. No face, it seems, was allowed to be traced to an individual with a name (in the age of Facebook and Vkontakte such tracing is not impossible). The behavior of these troops also seemed unfamiliar. The fact that they quietly exchanged words in Russian could not be taken as a sign of them being from Russia – most people in Crimea, an ethnically diverse place, speak Russian in daily interactions. These men were clearly not police and seemed incomparably more professional than self-organized “Crimean forces of self-defense” (which look and act as a motley crew of civilians in camouflage, “sportsmen” in track suits and self-styled Cossacks in grotesque uniforms). When Ukrainian journalists asked these soldiers what army they belonged to, they invariably received a non-answer: “We simply try to prevent violence”. These Russian military men do not look like Russian military men. I mean, they are definitely “Russian” and they are definitely “military men”, but they belong to some completely new, different breed of people. They look smart, they look nice, they look fit. They do not harass women. They do not steal vegetables from the fields. They do not wander aimlessly around the city. They do not say anything superfluous. And there is no insignia on their uniform. Besides, for some reason Putin said that this is not Russian Army at all. When I heard this, I actually felt offended — because these men look so good and because every last cretin on Earth understands that of course this is Russian Army. At the same time, if real Russian army actually looked this way, then I might even decide to join it. So striking was the presence of this anonymous force on Crimean streets that they were quickly named in Russian slang, “little polite green men” — vezhlevye zelenye chelovechki. The English translation does not do the name justice – “chelovechki” is not just “little men”, but small creatures that are like humans, but are not humans. The name refers to this force as if it were an army of leprechauns. Polite leprechauns with machine guns posed for pictures with children and young women, never taking off their masks and smiling with their eyes only (see pictures). (Their politeness, of course, was staged for the civilian gaze. When they occupied Ukrainian military bases, they failed to impress soldiers who were stationed there with politeness). What kind of a force were these little green men? What does their presence tell us about Ukraine, Russia, sovereignty, military occupation, post-Soviet lands? What we witnessed in Crimea is a curious new political technology — a military occupation that is staged as a non-occupation. These curious troops were designed to fulfill two contradictory things at once – to be anonymous and yet recognized by all, to be polite and yet frightening, to be identified as the Russian Army and yet, be different from the Russian Army. They were designed to be a pure, naked military force – a force without a state, without a face, without identity, without a clearly articulated goal. In the context of complex histories and political ambitions Putin’s government has always viewed Crimea as two different entities. The first one was part of the sovereign state of Ukraine, the second one was a territory outside of that state. The first one could not be legally occupied or annexed, the second one could be. The appearance of little green men reflects this paradoxical double vision. Crimea was occupied without being occupied. It was occupied by a non-army. This did not make its military force any less real, nor the results of the referendum that it helped to stage any less consequential. A deeper wound that Putin personally feels, and that seems to be shared by many Russians (although what exactly this “shared” means is a complex question), was produced by the disintegration of the Soviet Union in 1991. The disintegration was prompted by a secret agreement reached in Belovezhskaya Valley in Western Belarus, on December 8, 1991, by the then presidents of three (out of fifteen) Soviet republics — Russia (Boris Yeltsin), Ukraine (Leonid Kravchuk) and Belarus (Stanislav Shushkevich). The “Belavezha Accord” that they signed behind the back of the then Soviet president Mikhail Gorbachev resulted in the dissolution of the Soviet Union, and resulted in these three leaders emerging as presidents of newly sovereign states. All republics became independent states according to the borders that existed at that moment in the Soviet Union. Putin sees this secret agreement as a historical betrayal of Russia and those so-called “ethnic Russians” (an extremely tenuous category that is variously interpreted by different ideologically motivated parties in either linguistic, or biological, or cultural, or religious terms) who happened to be living and working in other Soviet republics at the moment the agreement was signed[i]. “Millions of Russians went to bed in one country and woke up in another, — said Putin in St George’s Hall, — overnight becoming ethnic minorities in former Soviet republics, while the Russian nation became one of the biggest, if not the biggest, ethnic group in the world to be divided by borders.” In this “blood-and-soil” vision of the world Crimea has been a particularly painful sore. “It was only when Crimea suddenly ended up in a different country, — added Putin, — that Russia realized that it had not simply been robbed but plundered”. One final point on the political technology of non-occupation. This technology is not only openly cynical – it is also designed to function as a cynical joke (if you share Putin’s sense of humor). Creating an army without insignia and saying, with a smirk, that “these are probably forces of Crimean self-defense who purchased their uniforms in a local store” (as Putin did on several occasions), is one of those jokes. Picking as the new Prime Minister of Crimea a man called Sergey Aksyonov (whom no one knew a month ago), is another. He is a name-sake of a famous Russian writer Vassily Aksyonov, author of a popular futuristic novel “The Island of Crimea.” The premise of Aksyonov’s novel is to imagine what would happen if early Soviet history went in a different direction. Crimea is the site where the White Army, fighting against the Bolshevik revolution, was finally defeated by the Red Army in 1920. But in Aksyonov’s novel the Whites are not defeated. They survive by cutting the narrow strip that connects Crimea to the mainland, thus turning the peninsula into an island. The island becomes an alternative capitalist Russia that develops quite differently from its mainland neighbor, communist Russia. Crimea becomes Russia’s Taiwan. While communist Russia gradually slides into totalitarianism, Crimean Russia becomes democratic, prosperous, modernized. It is crisscrossed by speedways, its seaports are surrounded with skyscrapers, its currency is wanted by international banks. When Putin picked Sergey Aksyonov to be Crimean Prime Minister, he must have done this with his trademark smirk. “The Island of Crimea” is finally floating back, suggested Putin. Addressing a huge rally at the Red Square in Moscow, on March 18, he said: “After a hard, long, and enduring voyage Crimea [is] returning to its native harbor, to Russia, to its permanent home port.” With these words little green men disappeared from Crimeans streets, quickly replaced by soldiers from regular Russian Army wearing regular baggy uniform with insignia and without masks, and stealing vegetables from the fields. Alexei Yurchak received his Ph.D. in cultural and linguistic anthropology from Duke University in 1997 (after having received a graduate degree in physics from Russia). His interests and areas of expertise include Soviet history and the processes of post-socialist transformation in the former Soviet Union and Eastern Europe; political institutions and ideologies in Soviet and post-Soviet Russia; political philosophy and language philosophy; the interface between language/discourse and power; comparative studies of communism and capitalism anthropology of media; visual anthropology; experimental artistic scenes (especially, Russia and US); urban geography and anthropology of space. He is both an Associate Professor in the UC Berkeley Department of Anthropology as well as a Core Faculty member in the graduate program at the Department of Theater, Dance, and Performance Studies at UC Berkeley. I would point out 2 things as being in need of carification; firstly, the Russian government also stated that Ukraine could not associate withboth the EU and Customs Union at the same time, making this a binary choice imposed on Ukraine by both sides, and secondly there are not 18 million Russians in contemporary Ukraine – census data says 17% of the population are Russians, which equates to roughly 7.8 million. This is a misconception widely spread in Russia, and has been stated by Putin himself. Your official count of ‘ethnic Russians’ appears to rely on the final Soviet census of 1989. There are less than 800,000 ethnic Russians in Belarus based on the last census there in 2009. If one isn’t sure whether a thing is new, one certainly isn’t in a position to assert that it’s unique. Russia may be executing a non-occupation in a distinctly post-Soviet and post-imperially Russian way. Russia may even be executing a non-occupation more effectively than any previous non-occupation. But there are certainly historical precedents for “a military occupation that is staged as a non-occupation.” See the United States’ non-occupied occupied territories, among other famously non-occupied occupied territories. See protectorates. See the history of colonialism. to the previous “Anonymous commentator” – In any of the cases you described were there anonymous troops without insignia, in masks, and pretending to be local employed? For it was these categories that made this technique potentially new. I have to admit, my knowledge of military history is not what it should be, but the history of the “uniform” versus, or maybe layered atop, the history of occupation might be an interesting way forward. 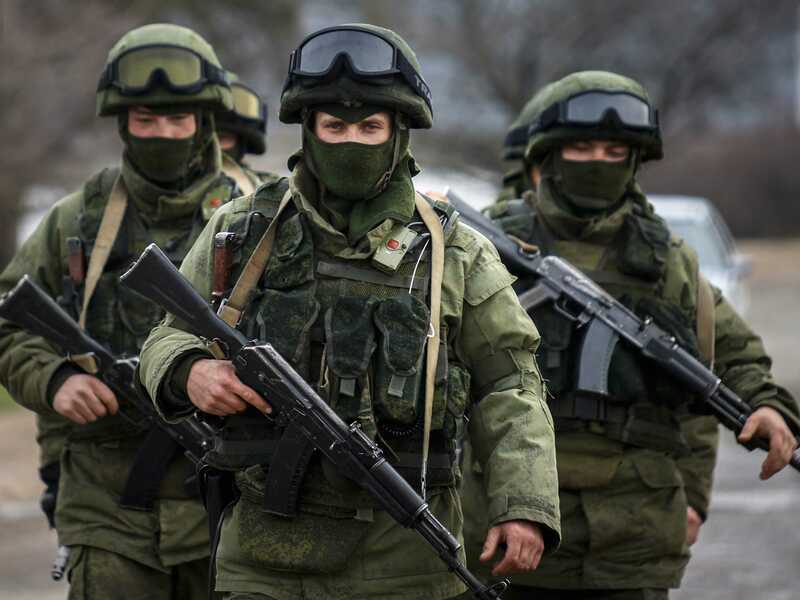 The “little green men” image originates with defense minister’s Serdiukov’s mockery of the military a few years ago. So the whole thing is largely about the soldiers’ having their private little joke… Overall, this article is very clever but it overanalyzes the issue. As another commenter pointed out, covert operations are nothing new or – I must emphasize this – exceptional or unique to Russia. To give just a couple of examples: (a) the Chechen opposition (with “unmarked” Russian soldiers operating unmarked heavy weapons) unsuccessfully attacking Grozny in August 1994, months before the first Russian invasion; (b) the Soviet-era invasion of Kabul by KGB troops dressed in Afghan uniforms w/o insignia (i.e., it’s not a post-Soviet issue); (c) the Bay of Pigs invasion and countless other covert ops by Western forces. The only innovation in the Crimean case is that the fact that special forces wear masks became widely publicized (this has been a custom for a long time and not just in Russia; given recent technological advances, it should not come as a surprise that spetsnaz GRU wanted to protect themselves and their families back home). As for the numbers of “ethnic Russians” in Ukraine, Belarus and other former Soviet places outside of Russia: this are the numbers that are quoted by Putin’s government and by its propagandists on “federal TV channels”. Of course these numbers are inflated. But then again, the very category of “ethnic Russians” is a tenuous one as I mentioned earlier in the text. As are comparable other categories. So all numbers are questionable and ideologically shaped. These “numbers” do not come only from census, but also from different polls and questionnaires, in which questions are formulated in different politically motivated ways. The whole point was to show that the numbers of “ethnic Russians” outside Russia, in the count of the current Russia’s government, are high and that therefore the implementation of non-occupation technology at some point may become a risk. I think it’s funny looking back at how mysterious and ominous people made this out to be. Since to anyone in-the-know at the time, it was exceedingly clear that that these were frontline Russian troops, from their newly issued AK-74Ms with 1P29 sights to their blatant digital flora uniforms only used by the Federation that were first used back in the South Ossetia conflict. the problem is not Putin, it is our arrogance, hypocrisy and aggressiveness. Russia has legitimate security concerns. When giving up the Soviet Union, Gorbachev and Bush agreed, albeit verbally, that Nato would stop at East Germany. Nato instead moved to the very borders of Ukraine. The West supported, financed and feted the violent Maidan protests. It staged a coup against a democratically elected president. It hailed elections called in a rush after the coup and recognized immediately a president elected only with the votes of the West Ukrainians. I think it has always been standard practice for spies who are turned to be highly honoured if they provide useful information – for example Philby, McClean, Burgess, lived out their days as honoured Russian citizens.